Deejay Drastik is now the Saturday night HOUSE DJ at the HKAN HOOKAH LOUNGE! he brings different special guest deejay's every saturday to keep it original and keep it moving ! 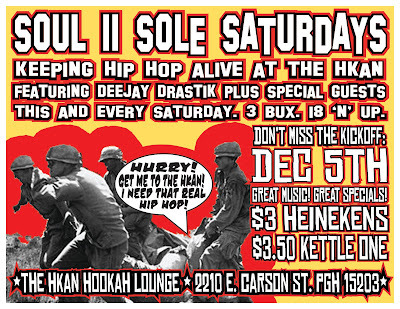 if you wanna hear the best music spun in south side, the HKAN hip hop saturdays is where you wanna be! the HKAN is a real relaxed lounge atmosphere with an area to dance if you feel the need ! if you just wanna chill, you can post up on the many couches and table sections, get a drink, smoke a hookah and chill aht! and tonites special GUEST DEEJAY: OLLIE 6.0 FM! YOU DO NOT WANNA MISS THIS! HO! HO! HO! MERRY KUSHMAS! 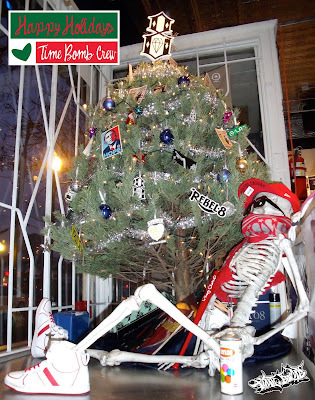 FROM THE TIME BOMB CREW! YINZ HAVE A SAFE AND PRODUCTIVE HOLIDAYS! THE HOLIDAYS ARE HERE! 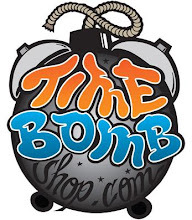 AND WEVE GOT THE MOST SOUGHT AFTER SHIRT .. OF COURSE ..
KILOGRAM RE-UP AT TIME BOMB SPOT! NEW JED HOLIDAY SWEATERS! THE ILLEST COLORWAYS FOR THE ILLEST TIME OF YEAR! Jed Clothing was launched in the spring of 2006 to fill a void in the men's contemporary arena. Sweaters, a fashion staple in the eighties to the mid nineties, had all but disappeared from the American retail scene and the timing was right to appeal to a new generation of consumers. and combinations of all, guaranteed to please the "preppy" crowd to the sneakerhead fashionistas. By re-tooling traditional silhouettes, Jed has carved a niche for those who demand fashion. Crew necks, v-necks, full zips, cardigans and vests- Jed does it all. Take one Jed sweater knit, layer it over a favorite tee, add your favorite jeans and finish it off with co-ordinating sneakers and you are "the man". Nothing more, nothing less. ENJOY! CROOKS AND CASTLES FRAMES! GET FRESH! NEW PLAY CLOTHS HOLIDAY DROP! WHAT?!?! KID ROBOT TOYS ! PERFECT FOR THE HOLIDAYS! PLAY CLOTHS! LETS GET IT! YES! MORE CROOKS and CASTLES AT TIME BOMB! Z-TRIP WITH DJ ROB SWIFT FOR ROC RAIDA TRIBUTE !